Without a doubt, the test shop is a large, separate building, with plumbing and heat. Tt is divided up to include a storage area adjoining a large door to the outside, a central workspace, and a finishing room that's walled off from the rest of the shop and ventilated to the outdoors. Obviously, establishing and maintaining such a shop requires money and space that most of us don't have available. So look for realistic alternatives. Space needs. You'll want to have enough space to maneuver full-size sheet goods and boards that are eight feet or longer Ideally, this means a large enough area that you can feed large stock into a stationary tool with enough clearance on the infeed and the outfeed side. Access, You'll need a convenient entry/exit point so you can carry materials into the shop and completed projects out of the shop. Power. You should never run more than one tool at a time (except a tool and a shop vac or dust collector). Nevertheless, you'll need several accessible outlets. Light. Adequate light is essential for doing careful, comfortable, accurate and safe work. You'll need good overall light (a combination of natural and artificial light sources is best) as well some movable task lighting. 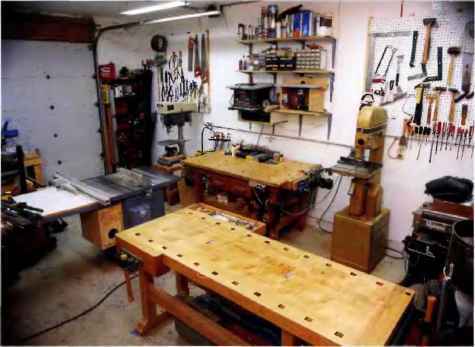 THE BASEMENT SHOP: The basement offers many advantages as a shop location. It's accessible yet set off from the rest of the house, and the essential house systems are right there. Drawbacks tend to be limited headroom, negligible natural light, concrete floors and overall dampness/poor ventilation. 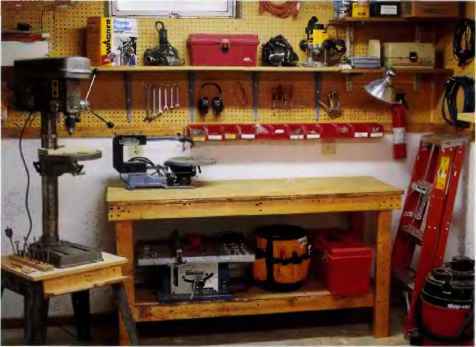 THE GARAGE SHOP: The garage, especially one attached to the house, offers the convenience of a basement shop with fewer drawbacks. Overhead doors provide excellent access, greater headroom, lower humidity and better ventilation. The main generai drawback Is that garages are usually home to one or more vehicles and a host of other outdoor items. A good solution Is to mount your stationary tools on casters so they can be wheeled out of the way to make room for other things. you need a source of fresh air and dust collection. Depending on where you live, year-round shop use likely will require a means of heating and/or cooling the shop as well as controlling humidity. Isolation. Keep the inevitable intrusions of noise and dirt into the rest of the home to a minimum. 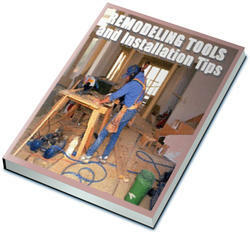 The workshop is perhaps the most accident-prone area of your home. Sharp blades, heavy objects, dangerous chemicals and flammable materials are just a few of the factor's that increase the risk of accidents in the shop. While good housekeeping, respect for your tools and common sense will go a long way toward reducing the risk of accidents, you should still be prepared in the event an accident occurs. Designate part of your shop as an emergency center. 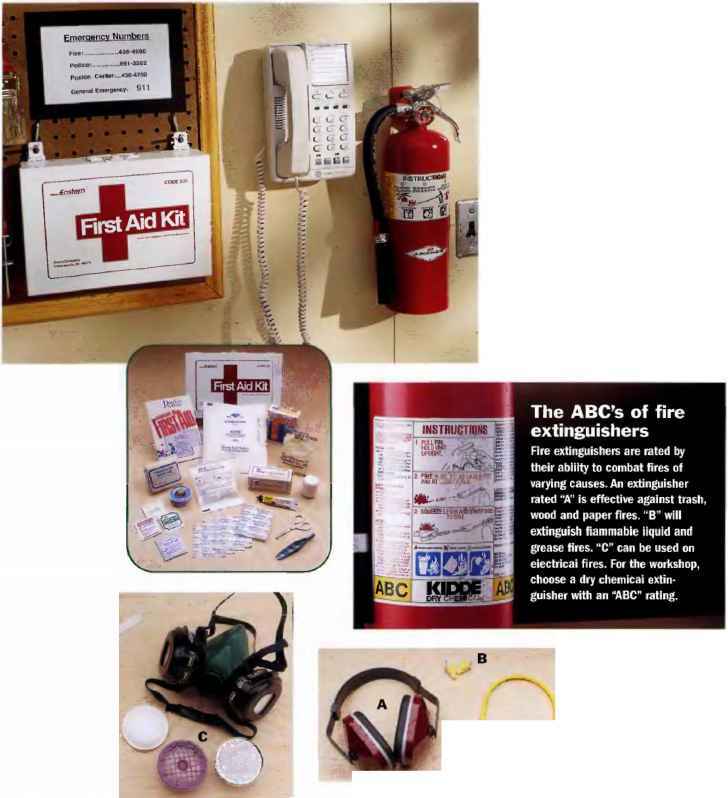 Equip it with a fully stocked first aid kit, fire extinguisher and telephone with emergency numbers clearly posted. Fire extinguishers are rated by their ability to combat fires of varying causes. An extinguisher rated "A" Is effective against trash, wood and paper fires. "B" will extinguish fiammabie liquid and grease fires. "C" can be used on eiectricai fires. For the workshop, choose a dry chemicai extinguisher with an "ABC" rating. A WELL-EQUIPPED FIRST AID KIT should contain (as a minimum) plenty of gauze and bandages, antiseptic first aid ointment, latex gloves, a cold compress, rubbing alcohol swabs, a disinfectant such as iodine, and a first aid guidebook. PROTECT against dust and fumes. A particle mask (A) Is a disposable item to be worn when doing general shop work. A dust mask (B) has replaceable filters and flexible faceplece to keep out finer particles, like sawdust and insulation fibers. A respirator (C) can be fitted with filters and cartridges to protect against fumes and very fine particles, especially when working with chemicals. EYE PROTECTION should be worn at all times In the workshop. 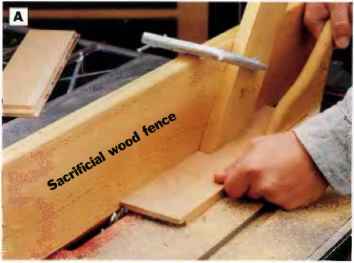 A face shield (A) Is worn when doing very hazardous work, such as operating a lathe. Safety goggles (B) and glasses (C) should have shatterproof polycarbonate lenses. PROTECT your hearing when operating power tools or performing other loud activities. Ear muffs (A) offer the best protection, followed by expandable foam earplugs (B) and corded ear inserts (C). Note; None of these treatments should be considered a substitute for medical attention. They are Intended as guidelines on how to react to workshop mishaps. Whenever anyone is injured, contact a doctor as soon as possible. 1) Maintain firm pressure on the wound with a dean cloth. 2) Dress with a gauze bandage. 3) If bleeding persists, and wound is a non-fracture, eievate the affected area so it is above the heart. 1) Clean wound with soap and water. 2) Looseiy cover wound with gauze bandage. 3) Apply insulated ice bag or coid compress to reduce swelling, relieve pain and impair absorption of toxins. 4) Be aware that internal bleeding may occur. 1) Leave the embedded object in place. Do NOT remove it. 2} Apply a clean cloth or gauze pad to the area around the wound. 3) Prevent movement of the object by wrapping It with gauze. 1) Maintain constant pressure with a dean cloth. 2) Carefully wrap severed Item in gauze that has been moistened with either water or saline solution. 3) Place severed Item In a sealed plastic bag. 4) Piace this bag into a larger bag containing water and Ice (never let severed part come In direct contact with Ice). 1) If the bum is more severe than first-degree (skin that is red or silghtfy swollen) It should not be treated at home. See a doctor immediately. 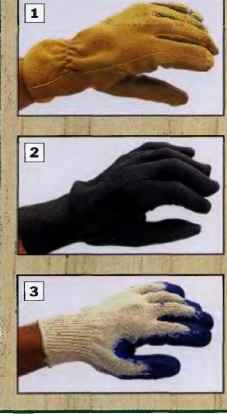 2) For minor burns, Immerse the affected area in cold water for five minutes. Gently apply a coid, wet doth to areas that are unabie to be immersed. Change the cloth frequently. 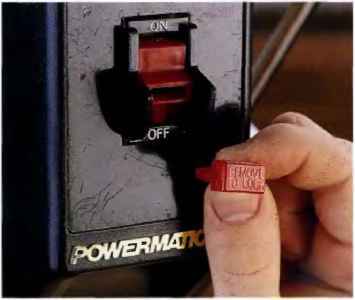 1) Quickly and safely break victim's contact with affecting current (disconnect plug or shut off breaker). 2) ALL electrical bums should be considered severe. Internal tissue may be affected more severely than the minor damage appearing on the skin. 911 should be called immediately if the electrical shock has caused any of the following: erratic heartbeat, severe jolt, abnormal tingling, unconsciousness (momentary or prolonged), muscle spasms or aches, fatigue, headaches or a visible burn. 1) Do not rub or irritate the affected eye. 2) Hush with warm water. Always wear the proper glove for the task at hand. 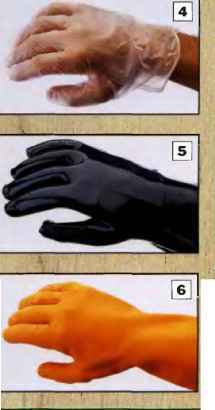 Maintain a supply of good-condition gloves of the following types, and add special purpose gloves as needed. Many power tools, particularly stationary tools, come equipped with a removable lock key that is inserted into the ON/OFF switch of the tool. The tool cannot be turned on if" the key is not in phice. Store the Jock keys in a convenient place that's out of sight from the» tool. are rated to handle the amperage of the tool.